the Ulster Folk: Britannia Rules Our Waves: the story of the song. Britannia Rules Our Waves: the story of the song. This song is inspired by a photograph that appeared on the Twitter feed of the Fishing For Leave campaign group. The image is of a young lad at the wheel of his father's fishing boat in England. His father was genuinely concerned that if EU fishing trawlers were allowed to continue plundering UK fishing waters then there would be no fishing industry for future generations. My personal link to the fishing industry is indirect: I simply love eating seafood and have done since I was a child. My family bought fresh fish once a week from the fishmongers. As a bonus on occasions the herring man would come around our street shouting out at the top of his voice, "Herns Alive! Herns Alive!". As children we mostly played outside in those days and when we heard the shouts of the herring man, from off in the neighbouring street, we all rushed indoors in excitement to inform our mothers. The older children were immediately sent back out with tanners and threepenny bits; plates, bowls or buckets, depending on the family size, to meet the herring man. The rest of the day was spent in exciting anticipation of the evening meal. The first time I experienced the herring man he came on a bicycle with the herrings in a large basket in front of his bike. After that he came in a small van. At the time I didn't give much thought to where the herring man came from: I was just interested in eating the herrings. In later years though I often wondered if he had actually rode his push-bike from the nearest fishing village which was fifteen miles away. That must have been very challenging indeed, especially riding up the hills with such a heavy load in the front basket. But they were a hardier breed back then. Another strong childhood memory that helps explain my love for the fruits de la mer relates to picturesque Portrush on the North Antrim Coast. My father made a caravan, back before caravans were popular and long before they were mass-produced in far-off places. He mostly parked it in Portrush, which back then had a significant harbour with a significant fishing fleet. On several occasions my father woke me and my older brother up at the crack of dawn to head down to the harbour to buy fresh fish. Sometimes we would watch from a distance as the fishing boats approached and by the time they docked in the harbour a crowd would be gathered around to purchase fish from the fresh catch. Customers standing on the pier reached buckets and other assorted containers to the fishermen in their boats. Containers were filled and money exchanged. Fish was in abundance back then: a traditional local industry still seemed to be in a healthy sustainable condition. In my adult life I have lived on the coasts of several places: Cape Cod, California, Mexico, Texas, Greece, France, Spain, Holland. I even worked in a fish market in Cape Cod for a while and got to sample every type of seafood available on the North American Atlantic Coast. Fish and seafood products in all those places always seemed to be still in abundance. That was before arriving in Nova Scotia in the Canadian Maritimes. I got there just in time to have just missed the collapse of the family fishing industry in the Bay of Fundy. That was in 1986. Local fishermen seemed unified in blaming the policies of the Canadian Federal Government in far-off Ottawa for the demise of the fish stocks. At that point I feared the EU, or at least the EEC as it was called back then,were applying the very same policies of short-term greed over long-term preservation of stocks. Turns out I was right. This song is dedicated to those spirited campaigners in the British fishing industry: currently engaged in a last-ditch battle to preserve traditional fishing grounds and stocks. In my opinion this single issue, on its own, is reason enough for leaving the EU. Post-Brexit: the potential for reviving all aspects of the British fishing industry is huge and exciting. Footnote: Title of song is Britannia Rules OUR Waves – not, Britannia Rules THE Waves. A family of fishermen and they say we've been fishing ever since the world begun. Herrings and haddock and hake and sole, in abundance for your plate. They come from the town and all around and all our fish they bought. They wrecked the seabed and left fish for dead and come back to plunder more. He says I fear for you my only son, no fishing boat you'll sail. 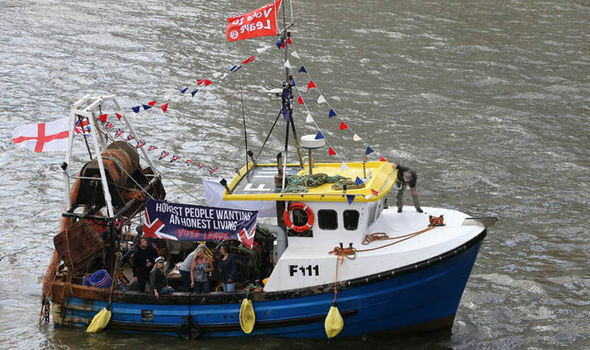 Our fishing boats are here to stay, Britannia rules our waves.